The Tower of the Swallow is what happens when an author wrestles with the middle-book problem, and loses. Nothing happens, or rather, a great deal happens but none of it matters a dickie-bird until the last 30 pages or so (out of 400), at which time Ciri, the child of destiny, definitively escapes the several people who have been trying to capture her and claims her power through the magic of the titular Tower. That’s too bad, really, because one of the virtues of Sapkowski’s series of books about the Witcher is that they have not followed the rhythms of Anglo-Saxon fantasy. Sapkowski grew up in communist Poland and began writing his fantastic stories as the old system collapsed. He draws on Polish history and legends, lightly, and structured his books and longer saga according to rhythms that do not match the customs of the genre as it has grown up in English. All of that has typically added to the fun of the gripping adventure tales that Sapkowski spins. There are familiar aspects, and memorable characters, but they are often at odd angles to expectations that I had built up over a lifetime of reading English-language fantasy stories. 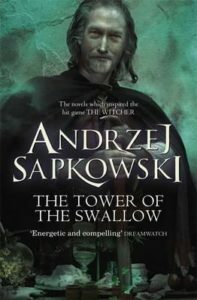 Indeed, I wrote that Baptism of Fire, the book immediately preceding The Tower of the Swallow, “does not seem to be aware that there is such a thing as a middle-book problem.” Maybe Sapkowski was still unaware in 1997, when he published The Tower of the Swallow, and that’s how he got so comprehensively waylaid. To recap, Ciri is the child of destiny, but she is actively avoiding it by running around with a bunch of brigands and basically taking advantage of the unsettled situation that general war has brought. The Tower of the Swallow opens with Ciri being found nearly dead and nursed back to health by a hermit who lives deep in the equivalent of the Pripyet Marshes. About half of the book recounts how she came to be in the swamp, while the other half follows the efforts of Geralt of Rivera, the Witcher who is tied to Ciri’s destiny, to catch up with her. There are a number of incidents that feature neither Geralt nor Ciri, and these detail either army movements, political machinations divorced from ties to any character I cared about, or efforts of a few other characters to try to find Ciri. The most memorable of those was the sorceress Yennefer, who is closely tied to Geralt in other stories, but it’s not clear in the end what she is up to or how it ties in to any other thing. I found myself skimming a great deal in this book, never a good sign. Telling Ciri’s story retrospectively, as she relates it to the hermit, just made the whole thing tedious. Her gang comes to a bad end; she spends a bad time as captor of a powerful bounty hunter; she claims some of her power and escapes, but is badly wounded and winds up deep in the swamps. Once she recovers, she leaves to meet the next stage of her destiny at the Tower of the Swallow. Geralt wanders around a lot, but never gets any closer to Ciri. The end. I sure hope that the long saga of Ciri and her destiny wraps up more convincingly in the next book, The Lady of the Lake. After that, there is a standalone Geralt novel to look forward to, Season of Storms. Sapkowski still writes enjoyable adventures, but The Tower of the Swallow just got away from him.